Okay it’s here. Tayto sent me 2 bars in the post yesterday, and they have just arrived in the letterbox. It’s about time therefore that I gave you “Tayto Chocolate – The Verdict”. I feel I owe it to you readers. 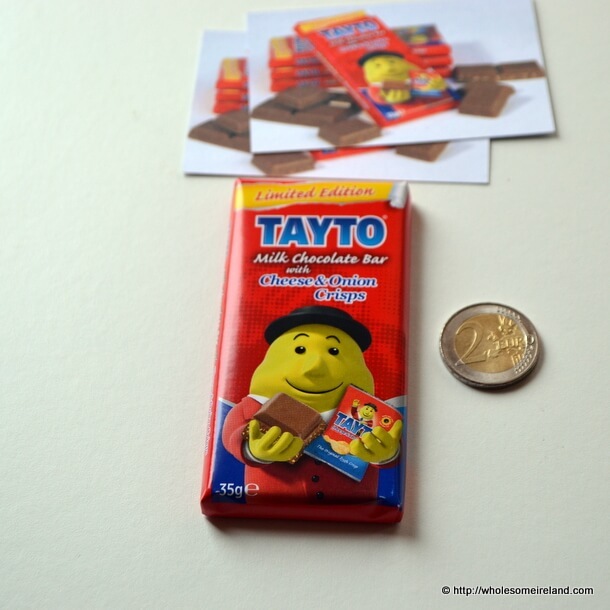 We all know who made the first Real Chocolate Tayto. If you have been living under a rock since January just click that link. They are smaller than I expected. I thought they’d be bigger. I’ve pictured the bar with a €2 coin for reference. The visual ratio of crisp to chocolate is sparse. You wouldn’t know that there were crisps in it unless you do some serious up-close inspection. The first flavour is sweet chocolate, then cheese & onion Tayto crisps. Is there an aftertaste of cheese and onion? Yes. If I ate a bag of Tayto I’d expect to get that aftertaste though. It is slightly stronger (and longer lasting) than a bag of the good stuff. I reckon that’s down to having to increase the flavourings to get them to “sing” over the chocolate notes. Does the chocolate taste “cheap”? No. I don’t think so anyway. Does it live up to my expectations? Mmmm I’m not sure. I made my iconic real Tayto crisps with both Cadbury’s Dairy Milk and high cocoa content dark chocolate. Both of which were flavours from my childhood. This is after all a nostalgia type product. I’m already sold on the flavour combination. I just think that you need a crisp texture that you don’t get from this chocolate bar. You could probably only get this from making them yourself. For a one-off purchase it’s good for the novelty factor. You’re probably going to love it or hate it. Either way you’d probably better hurry as there have only been 100,000 (one hundred thousand) bars manufactured and by all accounts they are flying out of the shops.They are available in Tayto Park in Ashbourne Co. Meath and will be stocked in Londis, Gala, Costcutter, Topaz, Spar, Mace, Eurospar, Daybreak plus other select retailers by the end of April. I’m guessing that the first person to start shipping these bars overseas will be minted. Note: Tayto Ireland & Presence PR provided me with the bars for the purposes of this review. My opinions are my own and I have not been paid to give them. I’d be inclined to agree on all counts. It’s a novelty but I’m not sure I’d be eating it again. 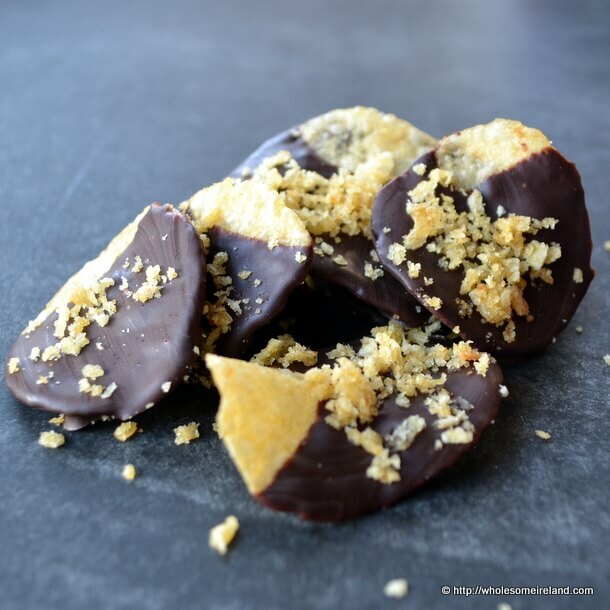 There is something quite decadent about dipping the crisps yourself into warm chocolate. I can imagine that they’re the kind of thing that will get tucked into lots of sending-overseas parcels! Sis sent a bar to me as I live in Asia. Tried it last night and not impressed. Combination doesn’t work unless as a kid you binged on crisps and chocolate at the same time, which never appealed to me! The chocolate is like any milk chocolate i.e. sugar and the crisps give a cheesy, mouldy aftertaste. I think you’ve hit the nail on the head there. Unless it’s something you enjoyed as a child, you’re not going to enjoy it now!